As the San Francisco Police Commission decides whether to equip the SFPD with Tasers, two national experts reforming traditional police training see a place for Tasers on an officer’s tool belt – but one also viewed them as less than critical. However, both agreed that training was key to using Tasers effectively. Sue Rahr, the director of the Washington State Criminal Justice Training Commission, and one of the leading experts in retraining and changing police culture, said Tasers have a role to play. Foremost, however, is the importance of equipping officers with “emotional intelligence,” which she sees as a tool to avoid the use of force. “We’ve moved away from the boot-camp model of training officers like we do soldiers, and we’ve moved to a model of training officers to see themselves as leaders, as critical thinkers,” Rahr said, referring to her organization’s training methods. When she was sheriff of King County, Washington, Rahr — who has 33 years of experience in law enforcement — required all of her officers to carry the stun-gun devices that San Francisco is now considering. According to a 2013 report by the Department of Justice, an estimated 85 percent of police departments that serve a population of at least 2,500 have approved the use of conducted energy devices, or Tasers. “I’m surprised San Francisco doesn’t have Tasers already,” said Rahr. Others, however, argue that equipping officers with Tasers actually led to more use of force because they escalated intense situations. A Taser, a gun-shaped object with a trigger, shoots two darts into its target and releases electrical shocks at varying levels to stun a suspect. A study by Reuters found that 1,005 deaths in the United States have resulted from people being stunned with a Taser, and other studies show that an earlier model of Tasers have a high failure rate. Axon, the largest manufacturer and seller of Tasers, is in an ongoing lawsuit with the Houston Police Department over the ineffectiveness of a Taser model introduced in 2011 with a reduced charge. While the effectiveness of Tasers is under review, Seth Stoughton, an associate professor at the University of South Carolina School of Law and a former law enforcement official, was cautious about police officers’ reliance on deploying Tasers. “Because it’s such an easy tool to use, and because the benefits can be very clear, officers may be tempted to use the Taser in situations … where they should, instead, be trying to verbally de-escalate,” Stoughton said. The issue of de-escalation has come up several times at the Police Commission’s public meetings on Tasers. Sheryl Davis, the executive director of the San Francisco Human Rights Commission, which is sponsoring the hearings on Tasers, said at Tuesday’s meeting that the device’s impact on the SFPD’s new de-escalation training was the community’s No. 1 concern. “It kind of depends on what the alternative to a Taser would be. If instead of using a Taser, an officer would have spent an extra five, 10, or 15 minutes, or longer, trying to verbally de-escalate a tense situation, then the use of a Taser is problematic,” Stoughton said. Stoughton notes, however, that de-escalation isn’t always easy, and officers often have a brief period to evaluate a situation and act. Rahr said she supports using de-escalation tactics first, but wants the public to know how difficult it is for an officer to de-escalate an intense circumstance. The most important aspect, she said, is how an officer responds to stressful situations. “We refer to it in this way: De-escalation is 90 percent proper control tactics,” Rahr said, referring to the training she gives her officers. “In my opinion, that is one of the most important things officers need to possess, is the ability to manage their own stress and their own emotional reaction to the things that they encounter in the field,” she added. Two local law enforcement officers agree with the use of de-escalation tactics and are adamant about their support for Tasers. Park Station Captain John Sanford said he has spent all 32 years of his law enforcement career with the SFPD, and has seen proposals to adopt Tasers fail three times. He thinks the time has come to start using them. “I believe that it’s a necessary tool for police officers to do their job, and do their job more effectively,” Sanford said. “That’s me just speaking as a human being, because I’d rather not have to take any serious form of force against anyone,” Prillinger said. Still, getting the public to trust officers with Tasers will be a tall task. According to the San Francisco Chronicle, between 2000 and 2015, there have been 95 reported shootings involving the SFPD, including 40 fatalities. Speakers at the Police Commission’s public hearings have made clear that people of color and the homeless are too often the victims of these killings. 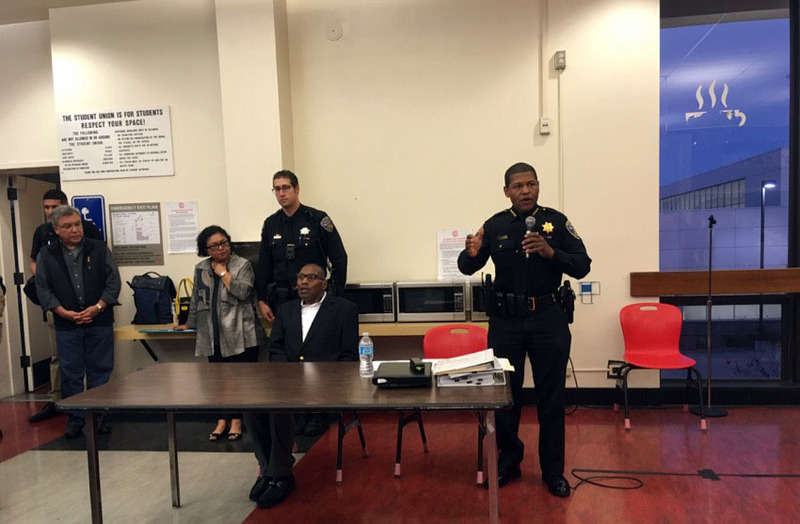 Captain Sanford sees SFPD’s relations with the community as part of a national dilemma. “If we speak candidly, I think we all know that it’s going to be very difficult regaining the community trust simply because of what has happened around the nation,” Sanford said. Some who spoke at the Police Commission’s public hearings oppose the implementation of Tasers on the basis that they run counter to SFPD’s progressive reform efforts. Those efforts just got tougher as the Department of Justice announced Tuesday that it would cut federal funding to collaborative reform programs with law enforcement agencies, like the SFPD. Despite the cut, SFPD Chief Bill Scott told Mission Local he will continue with the 272 recommendations the Department of Justice made in 2016. As for Tasers, the debate will continue on Oct. 2 at SFPD headquarters, where a working group, comprising several local organizations, will work on crafting the Taser policy that the Police Commission will later vote on. The Police Commission will meet at least once more before a final decision is made. Stoughton urges the San Francisco community to fight for reform — ­regardless of the Police Commission’s decision on Tasers.